You read the number right. The free-will offering taken last Saturday during the cleanup/spaghetti dinner netted $6,476. Funds will support congregation that supports the homeless and impoverished. Good Monday morning to you, and welcome to the Bainbridge Community Foundation. Thanks for choosing Bethany for your meeting. The rain held off this past Saturday as a large group of us tended to the more than 8 acres of the Bethany campus to make things look nice for Easter. 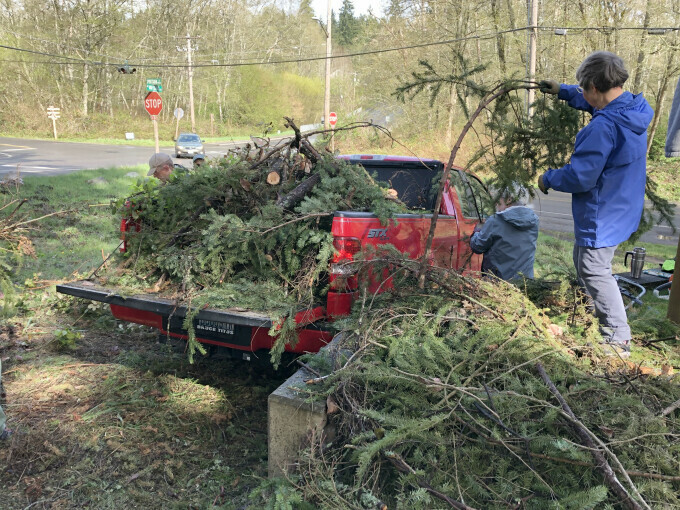 Members of Bethany joined members of the Church of Steadfast Love of Seattle as we picked up fallen tree limbs and hoisted them onto three pickup trucks. We also tackled stubborn blackberry vines and Scotch broom. The Church of Steadfast Love is part of the Compass Center in Seattle, which serves the homeless. Pastor Kristy Daniels leads the congregation. Here are some images.